Wide variety of Bikes & Scooters including Push Bike, Scooter Bike, Foot Bike, Kick Bike, Kick Scooter, Unmotorized Scooters, and Folding Adult Push Scooter. The original European-designed adult scooters! Available for 13 years in the USA and Canada. We offer quality adult push scooters for everyday, all around users. For fitness, transportation, to commute to work, bring back a dvd or get milk from the corner store. A great outing together for two or more riders. Get your exercise while kicking, having fun! Being pulled by your dog? Kick Scooters are naturals for dog scootering. Designed in Europe, these push scooters offer unparallelled fun, fitness and transportation. All Sidewalker models have equal size front and rear pneumatic wheels which add stability and smoothness to the ride, without compromising performance. 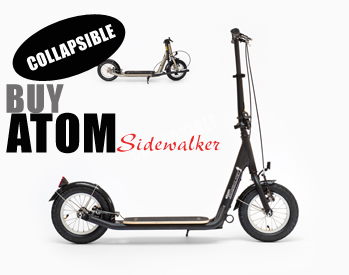 Designed with bicycle technology, Chromoly steel frames and high quality welds --- these are the proven secrets of the Sidewalker appeal and success. Sidewalker Scooters are made from Chromoly Steel, an extremely strong and light material. Our frames are warrantied for 2 years! If you are in the market for unmotorized scooter bike, adult foot bike or kick bike - you are at the right place. We offer best adult scooter bikes available on the market, including folding adult scooters.